The modern history of dowsing in sacred space begins with two men: Reginald Allender Smith, Keeper of the British and Egyptian Antiquities for the British Museum, and Alfred Watkins, inventor, miller, and lover of his Herefordshire countryside. Both were British, and did much of their work in the first forty years of this century. 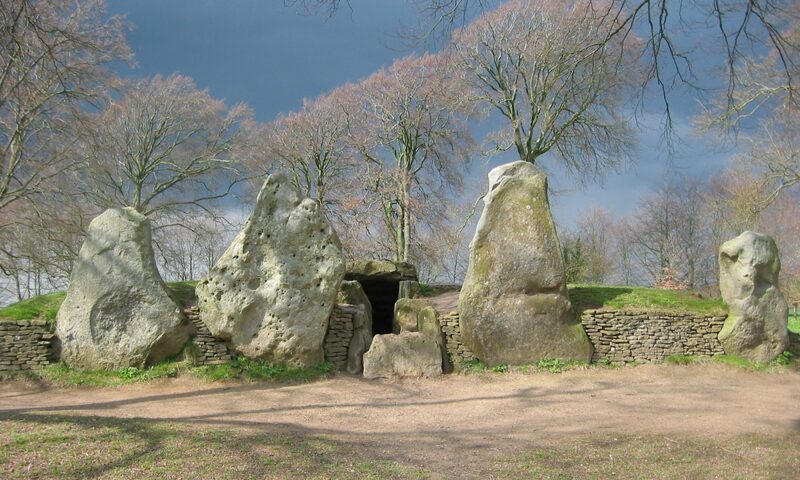 Allender Smith’s major contribution to dowsing in sacred space came with his discovery that there was water under all of the Neolithic (New Stone Age) British sacred sites. Watkins was the rediscoverer of the leys – alignments of ancient holy sites that crisscrossed the landscape. As far as I have traced it, it was Healer Bruce MacManaway (Patrick’s father), who combined these two – water and theenergy that sometimes flows along the leys. Kate and John Paine and Terry Ross brought these ideas of primary water and dowsable leys to the US, where I first learned about them in the early nineteen-seventies. Terry was one of my mentors for my Master’s Degree in Sacred Space in 1978. He taught me to find at bigger sacred spaces – a dome of water with an odd number of veins flowing away from it that exited the sacred space at significant points (at the comer of a stone, or the comer or mouth of a chamber, etc.). And there were (usually) one or more straight lines of energy crossing over the circular dome of water. At John Michell’s request, I began to call these straight lines “energy leys”, because I found that they were not always running concurrently with the leys, Alignments of holy sites1. (There are, of course, variations to this pattern, but the primary water and energy leys are the two essential ingredients.) Up until the early nineteen-eighties, I remained confident that this was a pattern that everyone should find at a sacred space. In the last thirty years, more and more people have heard about a number of enigmatic underground, dry stone-walled chambers that are found throughout much of New England. In the early eighties, the ASD/NEARA (New England Antiquities Research Association) Earth Mysteries Group (EMG) visited about forty of these chambers and found that forty percent of them were oriented toward a significant solar event (Solstices, Equinoxes or Cross Quarter Days), were constructed using sacred geometrical principals, and were located over Earth Energy Power centres2. These are true sacred spaces. I assumed that I could teach all of the volunteers who generously donated their time to that ASD/ NEARA EMG project to dowse the same things at sacred space. Some, like Inge Brown, were remarkably successful at finding what I found. Others weren’t. At first I thought it had to do with dowsing skill. If I could only make the others better dowsers! It didn’t work, at the end of the project, they still found different things! So I usually relied on Inge’s confirmation of what I had dowsed even though others had not found what I was finding. One of the forms of divination I have been working with since the beginning of the nineteen nineties is daysigns. If dreams are night-signs, daysigns are noticeable events that happen during the day that one can interpret using the similar skills one employs when working with dreams. Let’s say I am walking along a road thinking about a goal I have for a project I am working on, when an owl swoops towards me coming from the West. For me, and owl (Athena’s bird who spoke in her ear) means wisdom – the wise old owl, and West is the direction of the path of the Sun, Moon and stars, so, among other things, West has to do with goals. The daysign for me means, “The goal I was thinking about when the Owl swooped by from the West is a wise one. Go for it!” Unfortunately, that daysign doesn’t have that same meaning for everyone. Many Native Americans feel that an owl is a very unlucky omen, so it would carry a different meaning for them than it does for me. Daysigns must be interpreted by the individual who perceives them. Remember as a kid looking at clouds in the sky or at pine knots in a wall and seeing horses, dragons, and other animals? John Michell shows in his wonderful book, “Simulacra”3, that natural likenesses can be frequently found at sacred places. Simulacra can be interpreted using the same tools as for daysigns. And once again, like beauty, the interpretation is in the eye of the beholder. I am living in Glastonbury, England, an ancient site of pilgrimage for the Celts, for the earliest Christians who came to Britain, and today, for those who seek an alternative spiritual vision. It is a magical town with a number of very special places of power. The most obvious is the Glastonbury Tor, a terraced natural hill with a tower on top that dominates the countryside. In 1968, Geoffrey Russell put forth the theory that there was a three-dimensional Classical Seven Circuit Labyrinth superimposed on the Tor that one could actually walk to get to the tower on top. Arthurian scholar, Geoffrey Ashe4 , Dramatist and Representative of the Goddess, Kathy Jones5, and author and geomancer, Nicholas Mann6 have all written about this 3-D labyrinth on the Tor. I walked it with Kathy in the eighties. In 1991, 1 wrote a book about these magical single-path divinatory tools, “Labyrinths: Ancient Myths & Modern Uses”7 . My publisher, Gothic Image Publications, is in Glastonbury. I forgot to even mention the 3-D Glastonbury Tor Labyrinth! How could that be? Yes I’ve walked it. Yes, I have listened to others who have seen it. While I can work it out in the contour lines, I’m not 100% sure that I really “see” it. If you see it, it’s there, if you don’t, it isn’t. I would say that I am about 80% convinced. Then there’s the Glastonbury Zodiac. In the 1920’s Katherine Maltwood was looking for evidence about where King Arthur’s Twelve Knights of the Round Table had gone on their quests. She found, by looking at maps and the recently available aerial photographs, enormous signs of the Zodiac formed by rivers, old roads and hedge rows, steep contours and other features in the landscape. They were in the correct order, going around in a circle! Glastonbury is in Aquarius. Wearyall Hill is the hill where Joseph of Arimathea rested his feet when he first arrived in the Isles of Glass to survey the other islands; the place where his Jerusalem Thorn staff took root (a scion of that tree still grows there). When viewed from the top of the Tor, Wearyall Hill looks like a salmon leaping away from you. The Holy Thorn is in the crotch of the tail of the fish. Do you know what part of the body Pisces (the fishes) rules? The feet. The other fish of Pisces is in the town of Street, and in it is the Clark Shoes Factory, the largest manufacturer of footwear in Britain! Coincidence. For me, both the Tor labyrinth and the Maltwood Figures are like enormous Rorschach/ink blot tests. What you see is what you see, and if you see the zodiacal figures, you see them. If you see the labyrinth, it’s there. If you don’t … That’s OK too. At our Earth Energies Group 1998 Autumn meeting where we discussed geopathic stress, I was amazed to see and hear a general agreement that different dowsers do indeed find different things when dowsing for intangible targets. The morning address given by scientist Dr. Anthony Scofield made it clear that this was his finding, and while we could work together on different tasks that our workshop presenters gave us in the afternoon, we all did see what was there energetically rather differently. The implications for this are enormous. First is the total lack of repeatability, so essential to science. Second is the incredibly bewildering question each of us as dowsers must face when we get in to the Earth Energies and dowsing in sacred space, “WHY didn’t I find it where my teacher found it?” Different people look for domes and energy leys, vortexes, Curry and Hartmann Grids, Michael and Mary Lines, etc. With intangible targets, where’s the confirmation if everyone finds something different? The answer perhaps lies in the use to which you are employing dowsing. When one uses dowsing for physical objects like finding treasure, that’s using it as a physical tool, but when you dowse in sacred space, you are using dowsing as a spiritual tool that can assist you on your spiritual path. If you see yourself as a pilgrim on a life long spiritual path. dowsing can assist your journey regardless of the particular path you have chosen. On the spiritual path, each of us perceives it slightly differently. Is it a surprise that in dowsing, the same thing is true? What we find depends on things like our individual level of consciousness, and what our teacher has taught us to see (even if we don’t see it exactly the same as s/he does). Is it any wonder that there are so many Protestant denominations? Everyone sees it slightly differently! Forget trying to convince science that this kind of dowsing is “real.” Do you know anyone who is growing spiritually who puts much energy in to this one? Can science ever prove that God/dess exists? When used for spiritual growth, dowsing is a non-rational tool of the intuition. Learn how to dowse for underground water. Water is vitally connected to sacred space, healing and to many other intangible target dowsing opportunities. Encourage each individual to trust their own findings the most. This is primary. Listen to others, but ultimately decide for yourself. Gnow the truth within. Students need to hook up with an Earth Energy dowser that they resonate with (if in doubt, ask your pendulum), and apprentice yourself. Learn how they see it. Ask your rods to show you what your teacher is seeing. If that model works for you, use it, if not completely, add things that work for you. Then, when you go to a sacred site, after greeting the Spirit of the place, use the skills you’ve learned from your teacher to “see” the energies there. But, actually, more important to the spiritual dowser8, use your dowsing to find your place. Through triangulation, find the specific spot within that site where you will most benefit the site, and the site benefit you. Go there, and pay attention. Do you see simulacra or daysigns? What do you hear? Use all of your senses to pay attention. If you’ve come with a question, by being in the right place, you might experience an enlightening “coincidence” that will speak directly to your question. It is this kind of experience that the spiritual pilgrim seeks. As spiritual dowsers, we need to improve our skills at interpreting the messages that Nature sends our way along the path.